Marbella III is a 95 foot Heisley based in Palm Beach Gardens, FL. This beautiful yacht is nearly 20 years old with a recent face lift, including a new paint job. The owner and captain of the yacht both recognized the importance and need for this new paint to be protected. In years past they had used traditional wax solutions, but these products struggled to provide sufficient protection. Captain John reached out to Glidecoat to protect the paint and take advantage of our ceramic coating for yachts as the perfect solution! 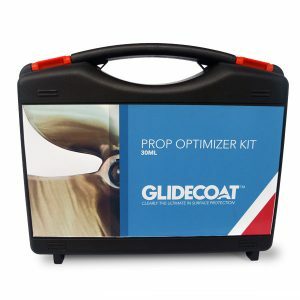 In most cases customers are seeking Glidecoat to apply to an older boat, in order to revive the appearance. 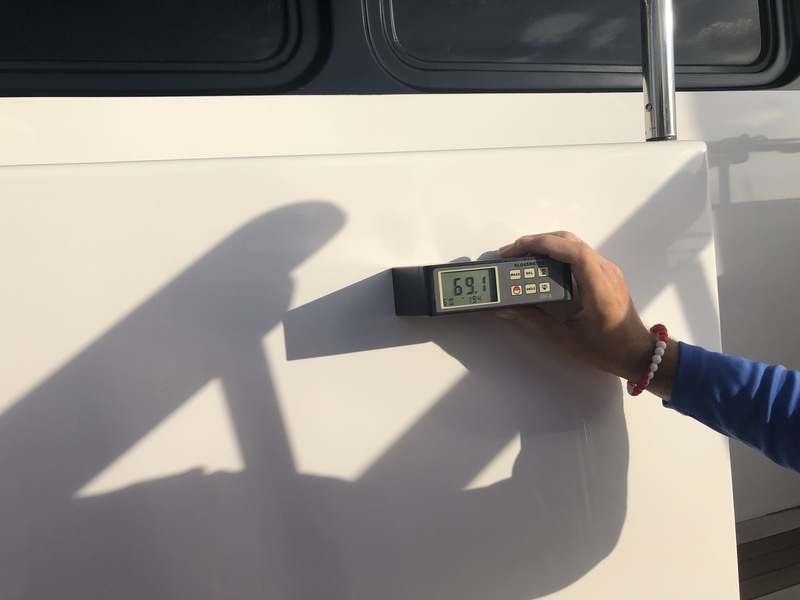 One of the most overlooked benefits our proprietary ceramic coating technology is applying our product onto a new boat, or in this case a new paint job, to preserve and protect new paint or gel coat before the deterioration begins. Having a yacht repainted is a large expense, so it only makes sense to protect your investment with the right product. When Glidecoat is applied to new paint or gel coat it helps extend the life of the surface, while enhancing and maintaining the new finish! 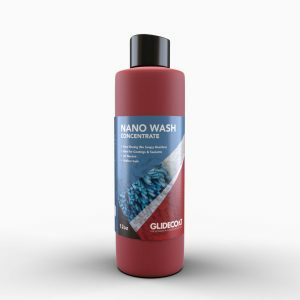 The first step in the process was to wash the hull with our Nano Wash, to remove any dirt, salt, or contaminants from the surface. (Due to the fact that this vessel is so large, we would complete the entire process in sections at a time until the entire hull and transom was completed.) 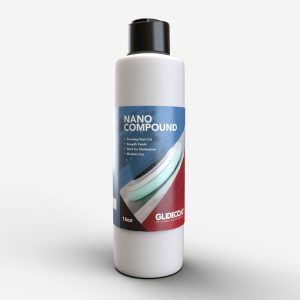 After Nano Wash we used black streak remover in some trouble areas to remove streaks from the exhaust or waterline areas, without the use of abrasives. Because the paint was so new the owner asked that we do not use a machine buffer on the surface. 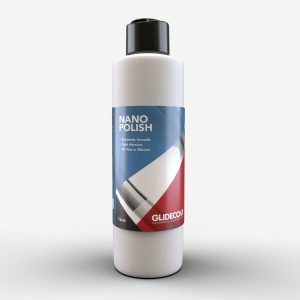 For any areas that required some polishing, we used Nano Polish by hand to remove any surfaces scuffs or scratches. Once the surface was free of imperfections, we used Surface Wipe to decontaminate the area before applying the coating. 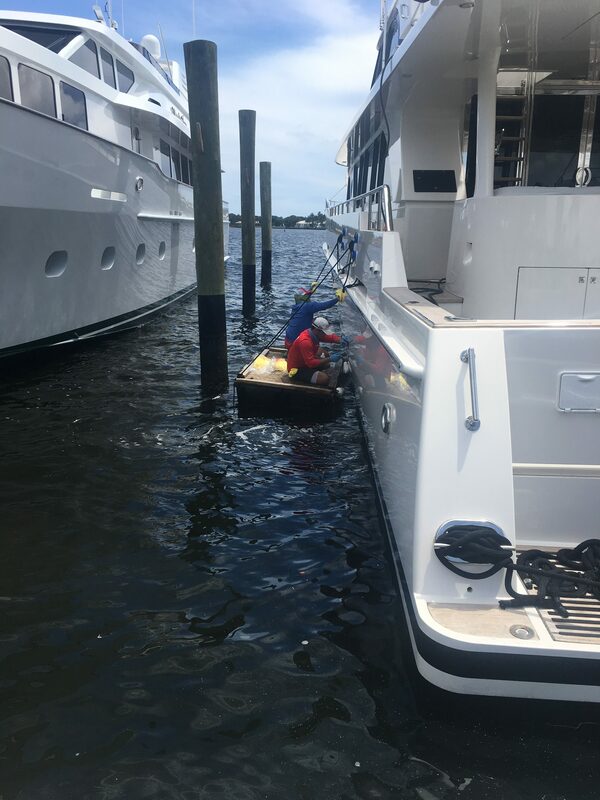 Working in 3' by 3' sections, our technicians applied the 9h ceramic coating to the hull of the boat, allowing the surface to appear as if it is sweating, then the coating is buffed in by hand with a microfiber towel. After completing the first coat over our designated area, we proceeded with the second and third coats of the coating. These steps were followed until the entire hull of the boat had three coats of our ceramic coating for yachts, spanning over 5 days. A raft was used to prep and coat the areas on the hull that could not be reached from the dock. The boat looks better than new!!! 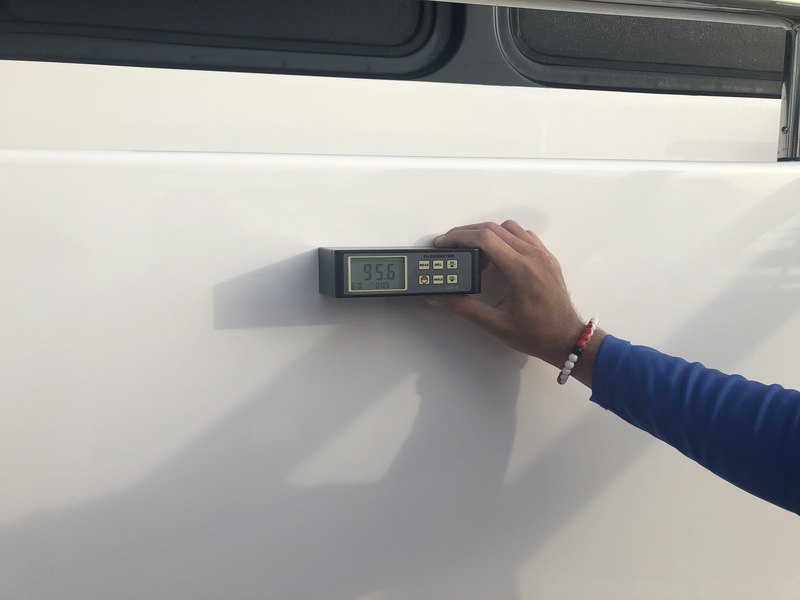 Before starting the Glidecoat application process, we used a Gloss Meter to measure the gloss of the 6 month old paint. The readings varied across some of the areas on the hull of the boat, ranging from 69.1 to 83.7. 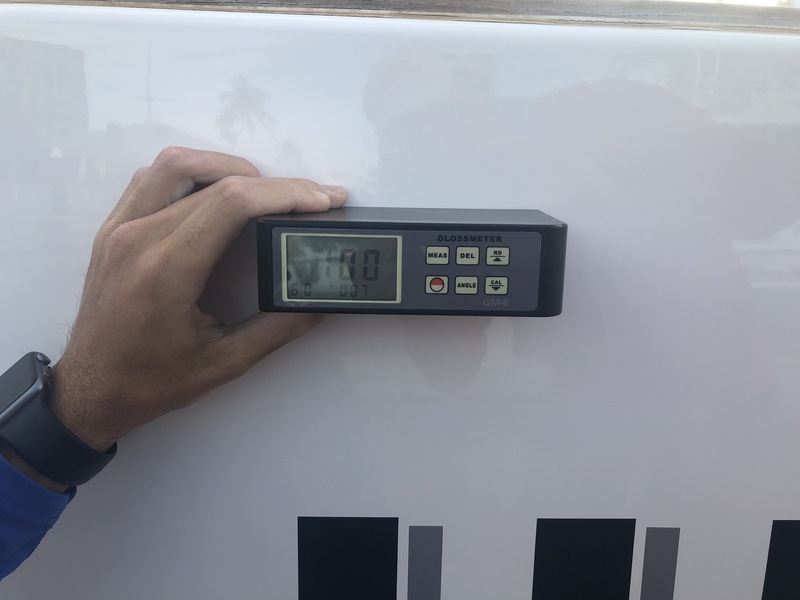 After the Glidecoat application process the Gloss Meter readings averaged in the 90s throughout the hull, with the highest reading coming in at an amazing 100! This shows how much Glidecoat's Ceramic Coating can enhance the shine of the surface, even on new paint or gel coat, while most importantly offering far superior protection than traditional wax. 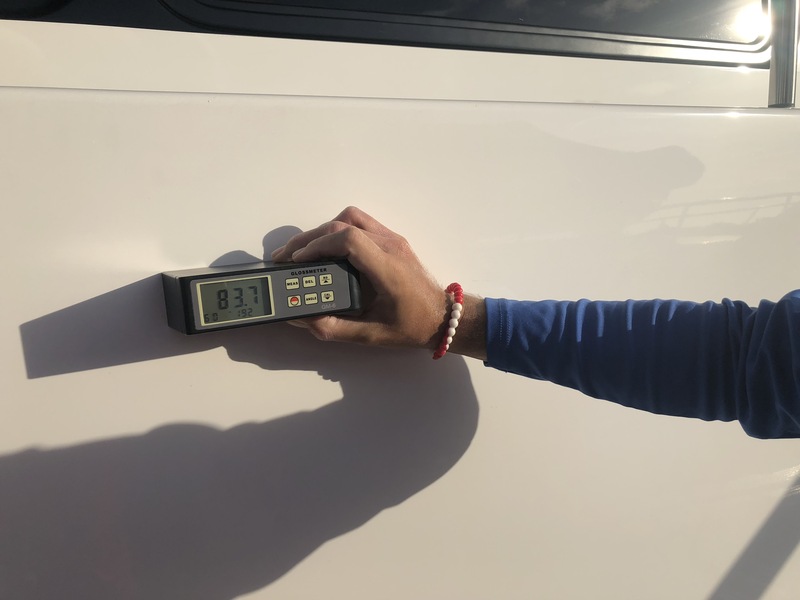 Gloss meter readings after 3 coats of Glidecoat Liquid Crystal Ceramic Coating hit an amazing 100!